Especially designed to meet the needs of anglers, the Swiss Army Fisherman includes a special blade for scaling fish. Ruler markings on the blade help determine legal limit size of catch. The hook disgorging notch at the blade's tip releases fish with minimal harm. 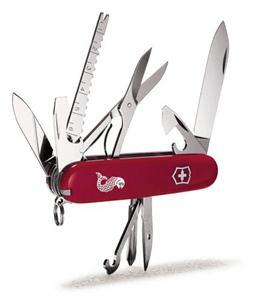 Several other large versions of the Swiss Army multi-tool knife do include this blade, but in combination with a heavy and unnecessary (for fishermen) assortment of other blades. Other options in this versatile knife include a small Phillips blade and a flat screwdriver tip combined with a bottle opener blade. Both come in handy when reels and other gear need emergency maintenance. Two knife blades and a scissors tool handle all types of fishing line and close trimming of knots. Along with that you get the usual can and bottle openers, tweezers, sewing eye/awl, and key ring. Though it might seem like a silly option, the plastic toothpick that neatly fits a notch in the handle has been one of the options I've used the most. Least useful would be the parcel hook, though it has provided considerable entertainment as I've tried to come up with practical applications for it. A good knife for camping and everyday use as well as for fishing, the Fisherman model is small enough to keep comfortably in the pocket. Inexpensive belt pouches are also available. The essential angler's tool missing is a pair of long nose pliers, but pliers in a knife of this type always turn out to be awkward anyway. A separate full-sized set of fisherman's pliers makes much better sense.